Whoops. Well, I finished my entry for the fair, but didn’t realize I needed to get it registered by Wednesday. I had it down as Friday. So, instead, that means that I’ve got my bit fair entry for next year done. Bummed I’m missing this year’s fair. Mostly because last year there weren’t many tatted lace pieces for show at the fair and there’s talk of them canceling the categories. Hopefully it sticks around another year and I’ll be able to help the tatters make a good showing then. 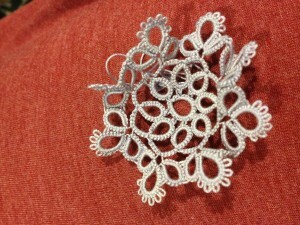 In the meantime, this means that I get another year to sew something to the center of this piece. 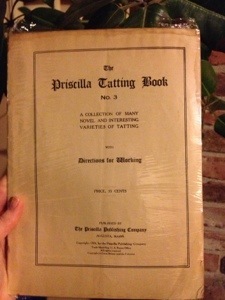 This piece is from the Priscilla Tatting Book #3. They suggest a piece of linen in the center and I’ll do something like that, but I haven’t quite figured out yet how to do the sewing. I guess that with a year to do it, I have some time to do some practice pieces. Also gives me time to write up the pattern. This piece was done in size 20. I’ll take some close-up pictures sometime soon too. This is my first attempt at a new motif from Priscilla Tatting #3. I started off tatting it exactly as written, but it became very clear very quickly that it wasn’t going to stay flat using that pattern. It always amazes me. They must have seriously blocked the wrinkles out of their pieces in the early 1900s. Half way through I made a couple adjustments and you can sort of see that one side is flatter than the other. I’m going to tat it again with a couple other changes and see if I can get it to lay flat. 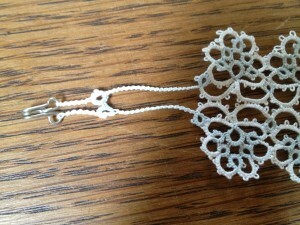 My plan is for this to be a necklace pendant so it’s going to need to be able to get by without any blocking. I’ve been AWOL here on the blog and I’m sorry for it. 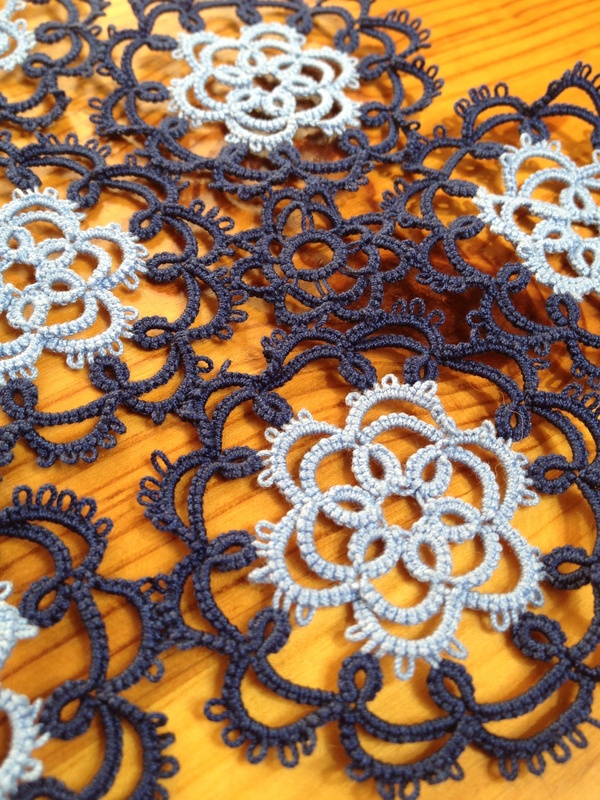 There’s been a lot going on in both my tatting and non-tatting life. 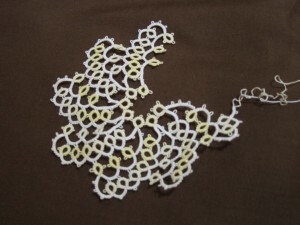 In my tatting life, I’ve been very busy teaching classes and preparing for teaching. 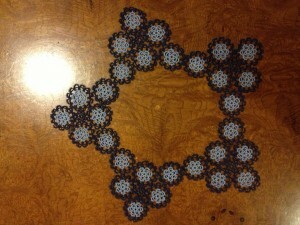 (Next beginner class is this Saturday at Bird Tail Beads in Bellevue.) In my non-tatting life, I have my last CPA exam on Friday the 23rd so I’ve been trying to stay pretty focused on studying. Hopefully, once the exam is done I’ll have a bit of a chance to catch my breath and you’ll hear from me more! 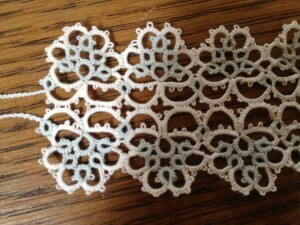 As I mentioned yesterday, I’ve been focused the last couple days on an easier pattern from Priscilla Tatting Book #3. In yesterday’s project I doubled it over to make a bracelet. In today’s project I just added a second row of all chains to finish it off. I think I might actually like this one better than the doubled over version. I’ve been playing around with two colors as well and think that this version does quite well with two colors. (Sorry for the poor lighting in the pictures lately. It gets dark around 4:30 here now and I haven’t been getting anything photographed during the day. Perhaps it’s time for me to invest in a lightbox. So what should I do? Focus in only on the complicated, incorrect or difficult projects? 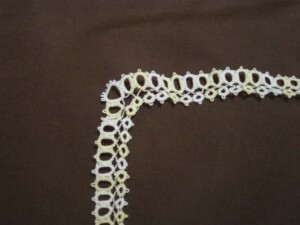 Or do everything including the easier patterns like this edging? I wouldn’t really feel comfortable charging money for the patterns for these easier ones that don’t require much (if any) modernizing, but also think that if I can do all the patterns in the books that tatters would appreciate having a complete set of all the modernized Priscilla pieces. What I think I’ve come up with is this: I’m going to go ahead and write-up the easier patterns the same way that I’m doing the more complicated ones. They are interesting to do, good practice for pattern writing of the bigger pieces, and most of all, a good motivation for me because they are easier to finish and will help keep me on track. These ones I’ll release for free on my website and on Craftsy.com. I figure they’ll be good advertising for the Priscilla project. When I put together the finished Priscilla project these will be included with the others in the PDF, but not calculated into the price of the PDF. If I get printed versions (my ultimate goal) then they will have to go into the calculation of the price because of the cost of printing, but it will all depend on the pricing/print run, etc. Of course, that’s way too far in the future with way too many unknowns to even think about. I have no idea how much of this is just me dreaming about ridiculous goals, but I really hope I can pull this off. Is this Priscilla project just my own obsession or will other tatters get enough use out of this modernization of the patterns to make it worthwhile? I’d hate to put all this work into it just to find out no one else is interested. I guess that is something else that releasing these free patterns will help me gauge as well. It’s been a busy couple weeks! A week ago from Friday I took my 2nd CPA exam. I think it went ok, but haven’t gotten my scores yet. Hope that I passed, but if I didn’t I certainly did learn a lot in the process and should have an easier time at retaking it so not too worried yet. This last week I’ve started studying for the next one, but since I have about a month have also set aside some time for tatting. I’ve been working on a couple new patterns or variations on old patterns, but what I’ve been a bit obsessed with over the last couple days is a couple of variations on a very simple pattern from Priscilla #3. Figure 21 is a simple edging that I’ve done two bracelet patterns from. Not sure why I’ve hooked on to this pattern so much over the last couple days, but it’s quick and easy and makes a nice piece. I think that I’ve just been in the mood to appreciate something that’s quick and easy with everything going on with the tests, work, recovering from hosting the family Thanksgiving dinner and getting ready for our Christmas vacation. I think I’ve finally gotten a study routine down. And since for the next 6-8 months my life revolves around the CPA exams (hopefully I can finish in 6) that means I know what my life will look like for that time. Sunday-Friday mornings are my primary study time. I have scheduled out what I want to get done each day and if all goes well I finish by noon or maybe 1. Afternoons when I’m usually the least mentally responsive are time for errands, with a sprinkling of review, catch-up (where needed) and working ahead (where possible). I’ve always been both a morning and a night person and it’s during the afternoons that I slow down so this new schedule of using the afternoon for things like grocery shopping and going to get the car’s oil changed have been working pretty well. Until last week I was trying to get more studying done in the afternoons and it just wasn’t working and leaving me stressed out because I wasn’t getting everything done. This week I’ve also gotten a fair bit of studying done during the evenings which has been nice, but that’s because Noah has been out of town on business. He’ll be back tonight and I’ll probably have to adjust my schedule for next week a bit. The good news with all of this talk about studying is that it means that I’ve figured out how to get my studying in a less stressful manner and now I don’t feel guilty about the time I’m tatting. Pictured above is a bracelet in size 80 that I just finished. Well, technically I finished the tatting about a month or so ago, but until a week and a half ago I hadn’t actually gotten the ends sewn in. During a lacemakers meeting I borrowed someone’s magnifying glasses and was finally able to get them tucked in nicely. It’s been a while since I’ve worked with 80 and I’d forgotten how much I like it. 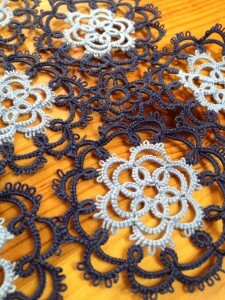 For years when I first started tatting it was all that I would work with. This project inspired me to pull out some of my copious amounts of the stuff and start playing around with some more smaller threaded projects even though I’m trying not to get too many new project started. 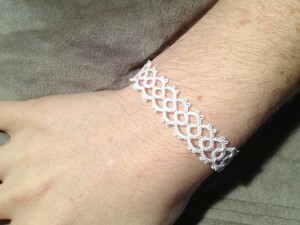 The pattern for this bracelet comes from the Priscilla books. I started at the hook and worked across on one side and then did the same on the other. I’m especially pleased with the bit I came up with for attaching it to the hook. Being able to do a bit of filler with some lock-stitch chains means the project is a bit more adjustable since the hook attaches directly to the lace to fit around the wrist and the overlap isn’t bulky. The split rings are a convenient way to hide the ends at the start of each side. I’m thinking of doing a necklace of a similar style, but it would end up being a choker, which I don’t really wear and I’m not sure yet I want to put that much time into a piece I’m not likely wear. I’ve been thinking about some variations that might work, so we’ll see if that’s something I’ll get around to eventually.